Figure 1: Blue boron-bearing diamond, with dark inclusions of a mineral called ferropericlase that were examined as part of this study. This gem weighs 0.03 carats. Photo by Evan M. Smith. This is an extended abstract of the article ‘Blue boron-bearing diamonds from Earth’s lower mantle,’ published in the journal Nature. GIA Research Scientist Evan Smith is the lead author of the article, with co-authors Steven B. Shirey, Carnegie Institution for Science; Stephen H. Richardson, University of Cape Town; Fabrizio Nestola, University of Padova; Emma S. Bullock, Carnegie Institution for Science; Jianhua Wang, Carnegie Institution for Science; and Wuyi Wang, Gemological Institute of America. Type IIb diamonds are a rare variety of diamond distinguished by having boron within the crystal structure, which can impart an attractive blue color. The famous Hope diamond is a perfect example of this blue diamond variety. Type IIb diamonds have long remained a geological enigma, but new research published in the August 2, 2018 issue of Nature reveals they are “superdeep” diamonds, meaning they crystallized much deeper in the earth than most other gem diamonds. Remarkably, the boron atoms contained in these blue gems may have originally been derived from ancient oceans. 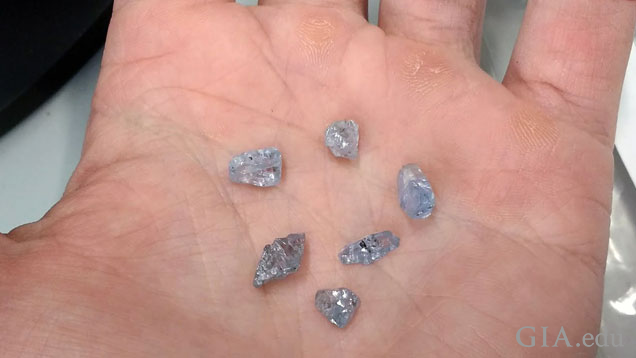 Figure 2: Rough blue diamonds weighing between 0.7 and 3 carats each. Examining rough samples, such as these, can be a good opportunity to see inclusions, because inclusions are often skillfully cut and polished away to optimize the appearance of the faceted gem. Photo by Evan M. Smith. Boron is an element that is strongly concentrated at Earth’s surface. But in the mantle, where diamonds grow, the concentration of boron is extremely low. The boron content of type IIb diamonds is therefore unexpected and challenging to explain. Blue diamonds have intrigued scientists for decades, but the high value and rarity of these gems and their near lack of mineral inclusions have been major hurdles to research. Prior to this study, no mineral inclusion had ever been identified in a type IIb diamond. However, systematic screening of diamonds submitted to GIA over two years made it possible to find and examine 46 type IIb diamonds with inclusions. 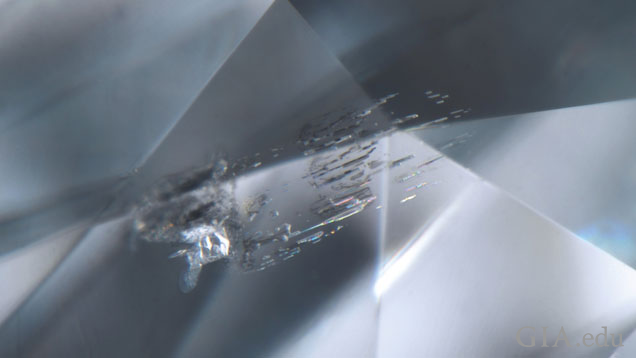 By studying the inclusions – small pieces of material trapped in the diamond during crystallization – the research team was able to deduce the host rock and depth where the diamonds grew. The minerals identified in these inclusions are only found together at extremely high pressures, very deep in the earth, leading to the conclusion that type IIb diamonds formed at least as deep as the transition zone (410–660 km), reaching into the lower mantle (>660 km). For comparison, this is approximately four times deeper than most other kinds of diamonds, which form near the base of old and thick continents at depths of about 150–200 km. The inclusions also show that, at this great depth, the diamonds grew in the presence of ocean crust which was carried down to the lower mantle by the conveyor-belt-like process of subduction. The connection with subducted oceanic lithosphere suggests that boron, responsible for the blue color in type IIb diamonds, may have been carried down from the earth’s surface. 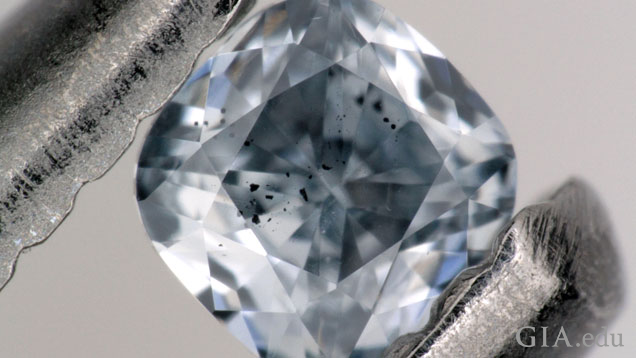 Figure 3: Inclusion of calcium silicate in a 0.21 carat blue diamond seen with the field view of 1.42 mm wide. This inclusion is evidence that the diamond grew at extreme depths in the mantle. Photo by Evan M. Smith. When seawater infiltrates the ocean floor, it causes chemical reactions that deposit boron into the oceanic lithosphere. This new study proposes a model whereby some of this boron is subducted with hydrous (water-bearing) minerals down to the lower mantle. At this great depth, the increased temperature and pressure break down the hydrous minerals, which then release a boron-enriched fluid that triggers diamond growth. Many of the inclusions in the blue diamonds that Smith and his colleagues examined have coexisting methane and hydrogen as a thin layer surrounding the solid minerals, providing evidence of diamond growth from such a boron-enriched hydrous fluid. This new study reveals not only that type IIb diamonds are among the deepest diamonds ever found, but also that boron and maybe even water can be carried from the ocean deep into the mantle by the process of subduction. This is a key observation for our understanding of mantle geochemistry and plate tectonic processes. 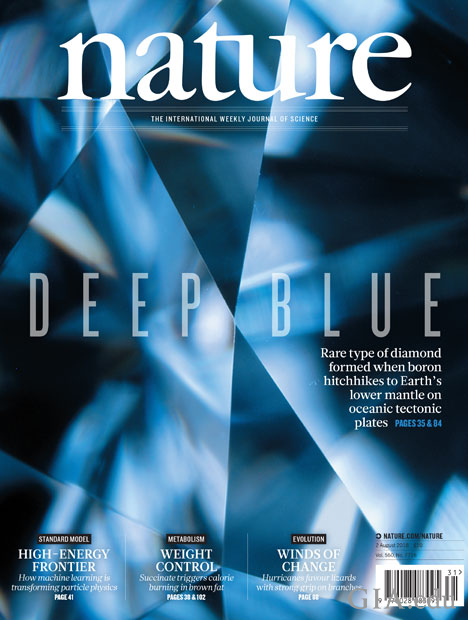 August 2018 Nature cover “Deep Blue,” explores Evan M. Smith’s research on type IIb blue diamonds that formed when boron hitchhikes to Earth’s lower mantle on oceanic tectonic plates. Image courtesy of Nature. Until recently, it was widely held that superdeep diamonds are always small and never of gem quality. This notion is upended by the present discovery that blue boron-bearing diamonds are superdeep, in addition to the 2016 finding that relatively large and pure (CLIPPIR) diamonds are also superdeep. Thus, many of the world’s most expensive and dazzling gem diamonds are superdeep diamonds, making them invaluable physical samples from the convecting mantle hundreds of kilometers beneath our feet. Dr. Evan Smith will present this research at GIA’s International Gemological Symposium, Oct. 7-9 in Carlsbad, CA. For more information on the program and to register, visit symposium.GIA.edu.